A search for the "terroir" of the famous French cool-climate areas of northern France in Australia led me to buy land in partnership with my brother David, in northern Tasmania in December 1973. This search study became part of my doctoral thesis on viticulture completed at the University of Sydney in 1977. The vineyard was named Pipers Brook Vineyard after the local brook and is now part of history. Pipers Brook's second-label Ninth Island became the most widely distributed and recognized label from Tasmania. Pirie was the Pipers Brook sparkling wine label and was first made in 1995. It became the most awarded of all the wines I made and has been drunk by Her Majesty Queen Elizabeth II on at least two occasions. The climatology which led me to the Pipers Brook area was crude by today's standards. 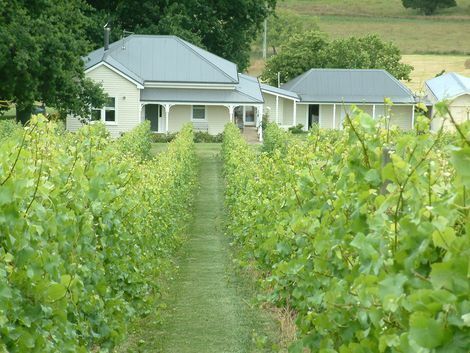 Pipers Brook scored some "bulls-eyes" in planting chardonnay and riesling in the cool area close to the north coast of Tasmania. In later years however the cooler slopes produced great sparkling wines and by the time I left Pipers Brook in 2003, sparklings were our most acclaimed wine style world-wide. I have continued to research wine climates and these days the knowledge is more precise in predicting "terroir". In a paper at the International Cool Climate Symposium in Hobart in 2012 I selected the best index for predicting grapevine ripening in cool climates. When the opportunity to apply this learning arose again recently I could not resist planting another sparkling wine vineyard in what appeared to be a grand cru sparkling site. I named the vineyard Apogee, meaning the highest point. Having managed vineyards in the past in Tasmania from 200-413 hectares, with appropriate work-forces, I am strengthening my view that small scale IS important in the search for the highest quality. 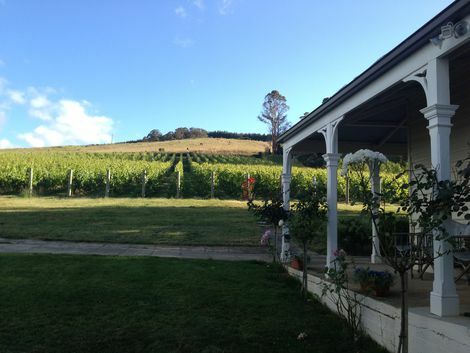 Apogee was awarded Tasmanian Vineyard of the Year Award in 2013 which was the first independent test of progress on this journey. Apogee will not grow in scale under my watch. This limits production to between 10,000 and 20,000 bottles per year. The goal is to produce very high quality wines from a small, hand tended area which is operated on a commercial and sustainable basis. I hope and believe that the combination of the highly researched site with the latest knowledge of terroir theory is leading to wines which are very expressive of the terroir. To order, please go to the Buy Wine tab and use the shopping cart or download our Order Form; scan and email to info@apogeetasmania.com . 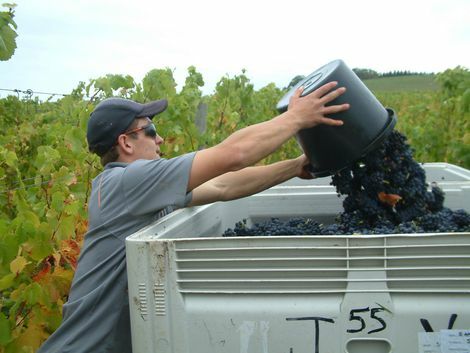 Pinot noir grapes shown here being harvested from Block 2 just above the house.